ruah. to spit. by Judy Tuwaletstiwa(American, b.1941), fused glass, pigment, kaolin, canvas, adhesive. Corning Museum of Glass. Photo by Wayne Stratz. 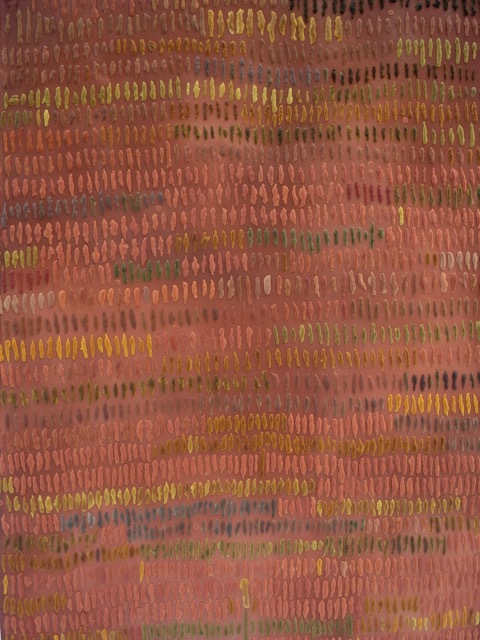 Judy Tuwaletstiwa began her career as a weaver and a painter and first worked with glass in 1998. In her painting ruah. to spit, small fused-glass elements were used like brushstrokes. To create them, she mixed her own specially colored glass powders and spooned them onto the shelves of a kiln, fusing them into long, oval shapes that she glued onto a painted canvas. The granular texture of the glass elements gives her painting a three-dimensional quality. The way Tuwaletstiwa moves among mediums, from weaving to painting, to clay to glass and yet her vision unifies them, and finds the commonalities. Textiles, especially quilts, are what excite my own glass art, and when I look at this piece, I see the influence of fabric, and yet, not a rote copying of another medium, but being informed by it. Learn to see. Really see. Notice the smallest blade ofgrass. How the light reflects off of it, how it grows. Notice what is around you. Turn off the television. Sit in silence. Listen. Each day notice something new. Educate yourself. Do not let a day pass by without noticing something you didn’t see the day before. When you look at a photograph, study it. Learn about this large world in which we live.